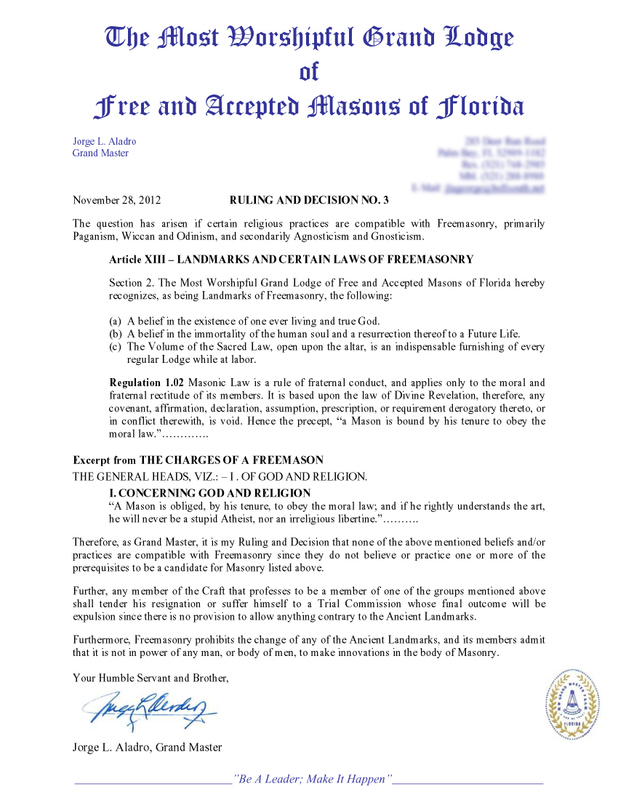 The Grand Master of Florida’s decision number 3 can be found on the Grand Lodge of Florida website. The text of the document appears, as transcribed, below. (a) A belief in the existence of one ever living and true God. (b) A belief in the immortality of the human soul and a resurrection thereof to a Future Life. (c) The Volume of the Sacred Law, open upon the altar, is an indispensable furnishing of every regular Lodge while at labor. Regulation 1.02 Masonic Law is a rule of fraternal conduct, and applies only to the moral and fraternal rectitude of its members. It is based upon the law of Divine Revelation, therefore, any covenant, affirmation, declaration, assumption, prescription, or requirement derogatory thereto, or in conflict therewith, is void. Hence the precept, “a Mason is bound by his tenure to obey the moral law.”…………. THE GENERAL HEADS, VIZ. : – I . OF GOD AND RELIGION. This edict applies to a particular Brother. Full story to follow. Or, you can download the original PDF document as published on the site. I don’t think it is totally accurate to suggest that white masons are only objecting to Wiccans being persecuted, when Fred Milligan and I have both commented upon the injustice meted out to PHA masons both in posts and on our blogs. Fred, who as a white mason is a member of the PHA has posted repeatedly on the subject in the past, and most recently I posted on the subject at the link below: http://hedgemason.blogspot.com/2012/11/rough-ashlar-no-1.html . Whether it’s discouraging Prince Hall Masons from attending non-PHA lodges, making arrogant proclamations about what religions are to be considered valid, or anything of that nature, if it’s being done it equals Masons behaving in a non-Masonic manner. Mason is as Mason does, even if he’s the GM. I think the Lodges need to rely on a less biased sense of morals and ethics and not the lawyers. Why yes, GRAND lodges should, indeed, focus more on a less biased system of morals. This proves that organized Freemasonry has been turned into something profane.